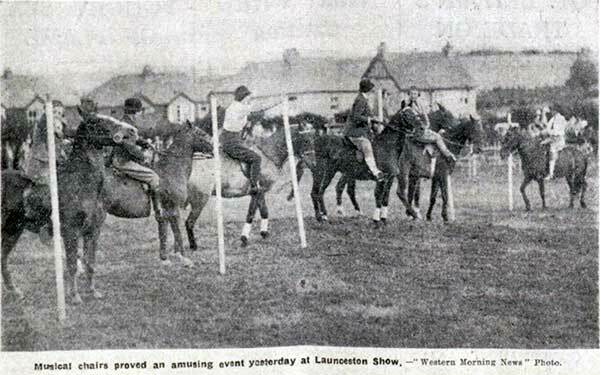 Launceston's horse show from its inception. | Launceston Then! 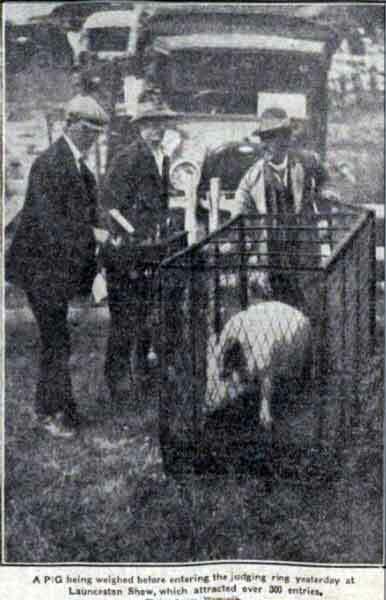 On the 29th of February 1887 a small group of farmers, breeders and others interested in agriculture met at the White Hart Hotel, Launceston, and decided to hold a horse show. 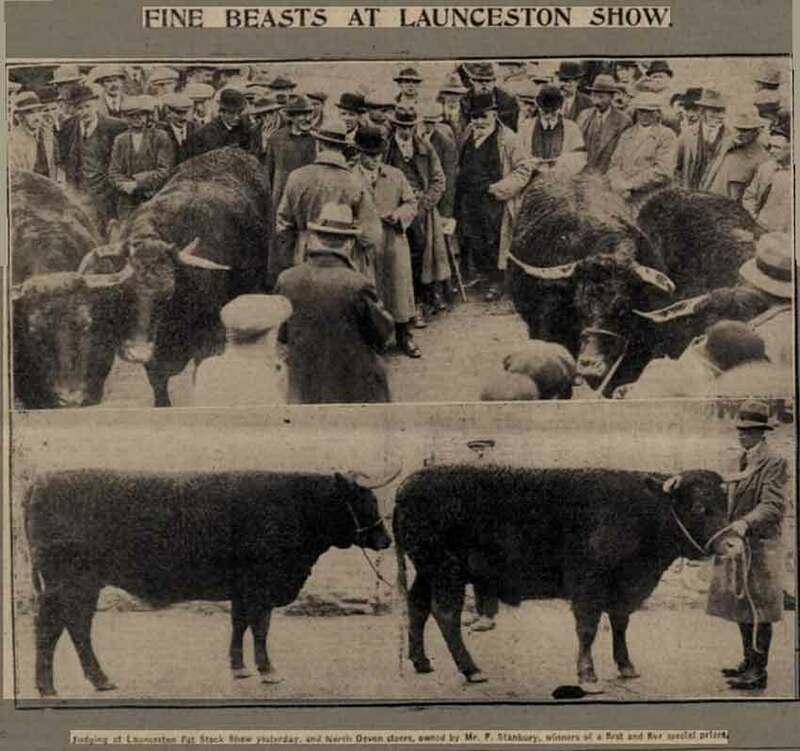 The Launceston Agricultural Society soon became an established organisation. 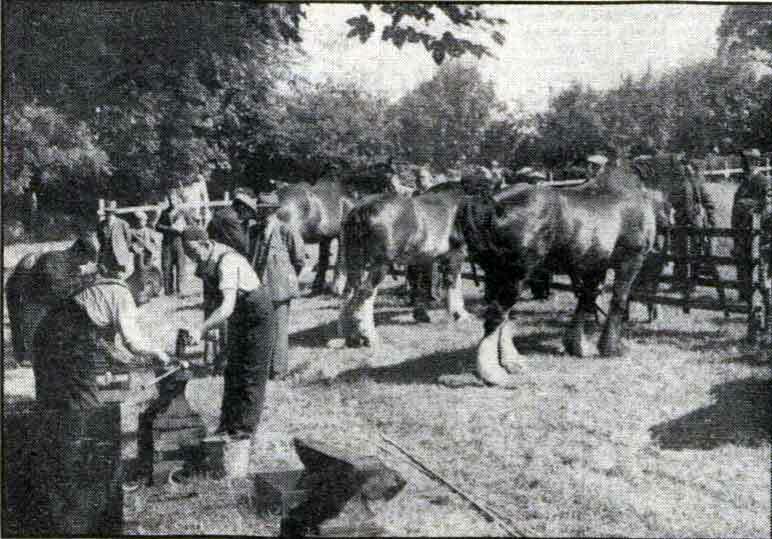 The first show was held in July of 1887 at Mr. John Cory’s farm at Kensey and was just for horses, cattle and sheep were included the following year. 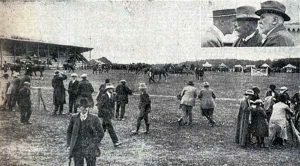 Mr. C. G. Archer of Trelaske was the first shows President with Dr. Shepherd and Messrs J. Kitto, J. Palmer, G. Lobb, and J. Vickary the Stewards. Mr. C. Parsons was the Vetenary and Mr. Hare the Treasurer. The Hon. Secretary was Mr. N. Lobb. 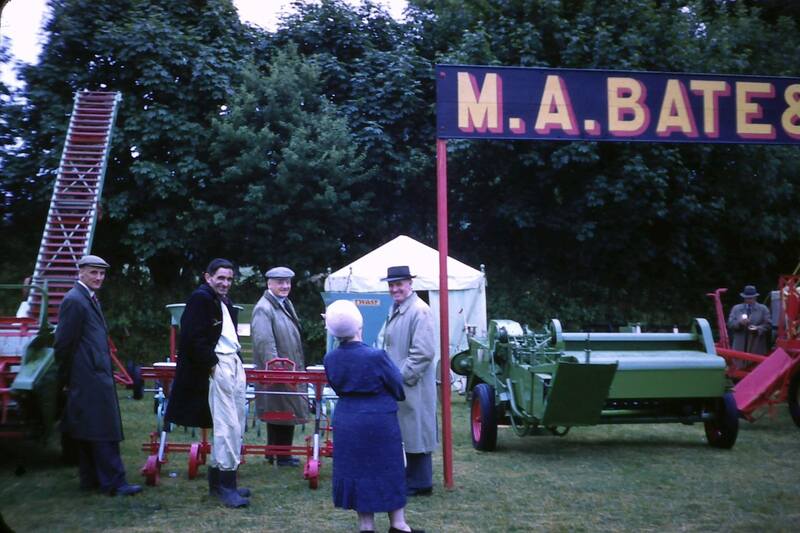 The judges for agricultural horses were M.r. Lang, of Knowle, Sidmouth, and Mr. Henry Brown, of St. Austell. Hacks, hunters, and cariage horses were judged by the Earl of Portsmouth, Mr. C. H. Basset, and MR. G. B. Battams. 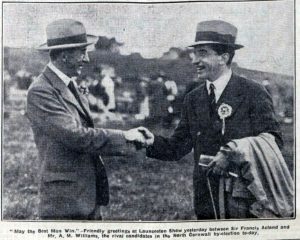 Sir Francis Acland (Liberal) shakes the hand of Mr. A. M. Williams (Conservative) as they meet at the 1932 show just before the by-election. 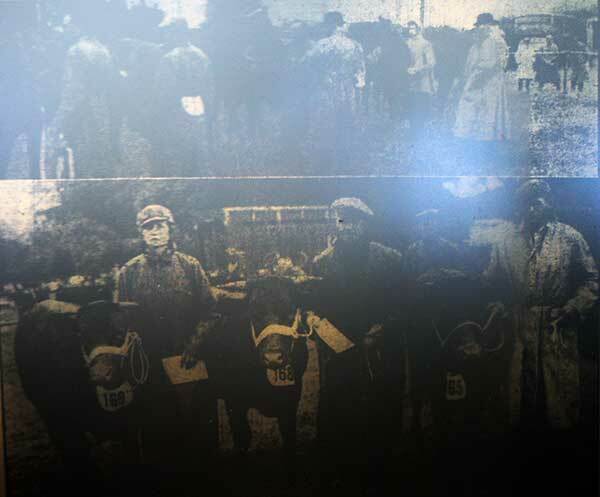 In the early years, the Show was held within the town boundary of Launceston with Pennygillam, Windmill and Scarne being used. The show moved to its current site at Kennards House in the mid 1950’s. 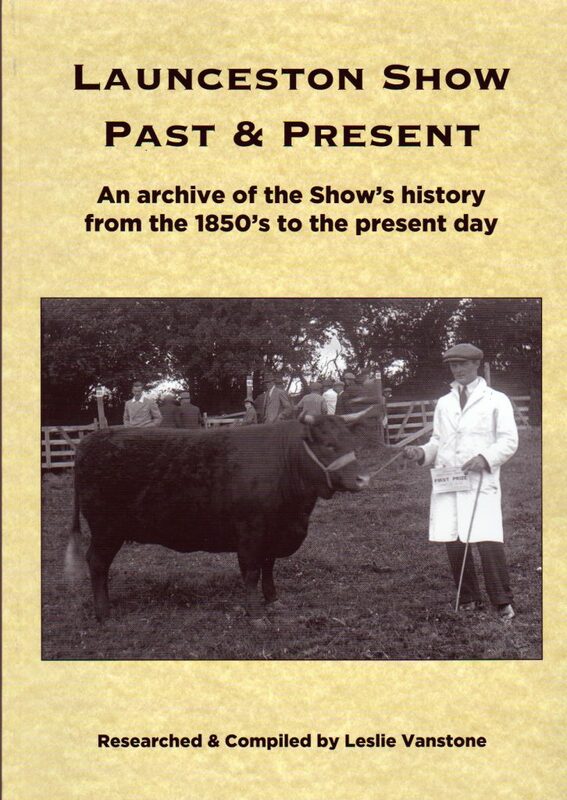 Launceston Horse Show as it was known was highly respected as an equestrian event, and before the popularity of the motor car large crowds gathered each year with the railways running special “Show Trains” from places such as Plymouth to the event. 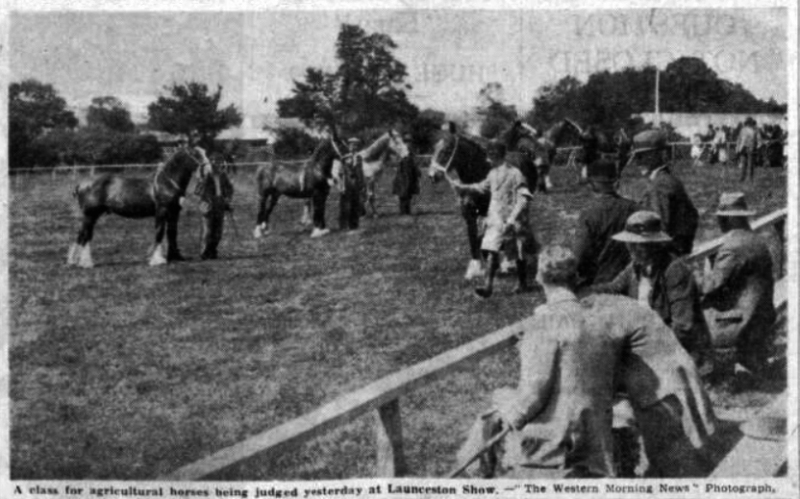 1892 Launceston Horse Show Article. 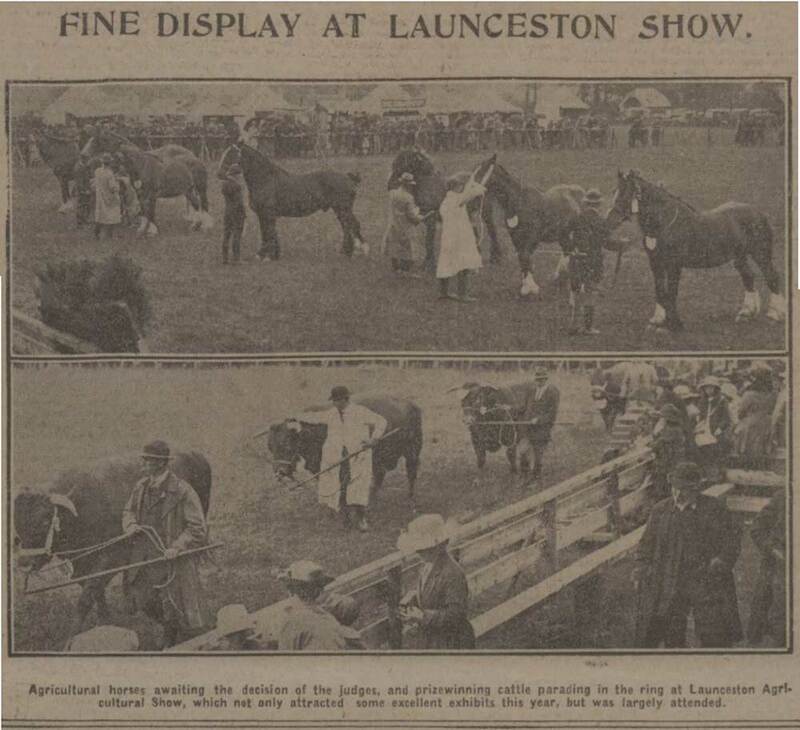 1887 article on Launceston Horse Show. 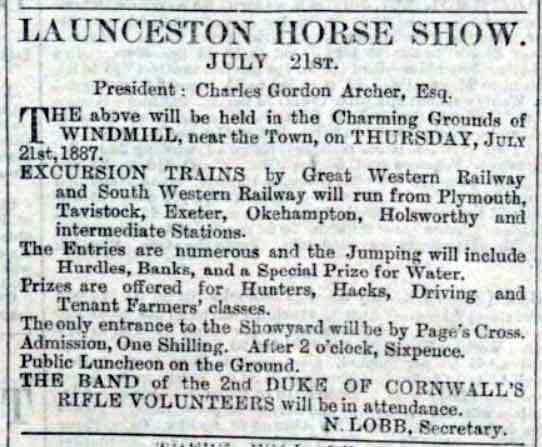 1887 Launceston Horse Show advert. 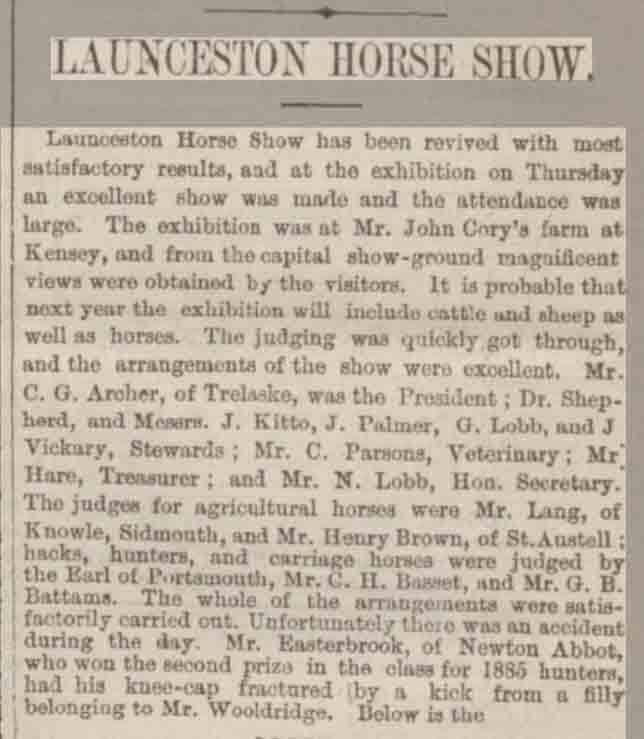 1887 Launceston Horse Show prizewinners. 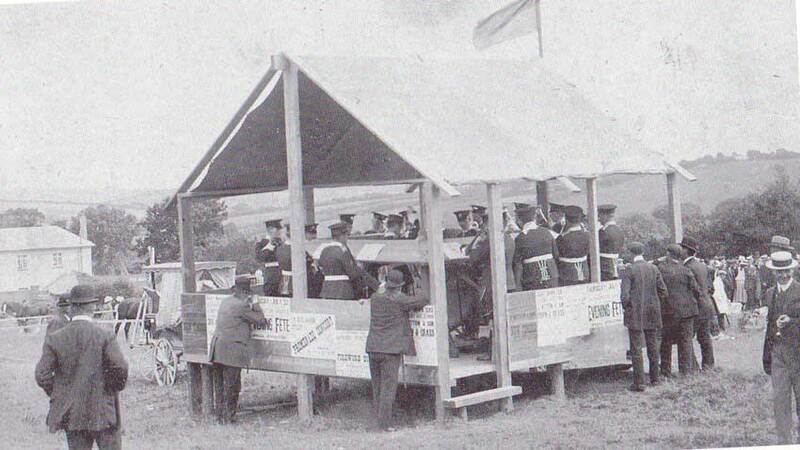 The band of 'HMS Reknown' playing at the 1920 Launceston Horse Show. 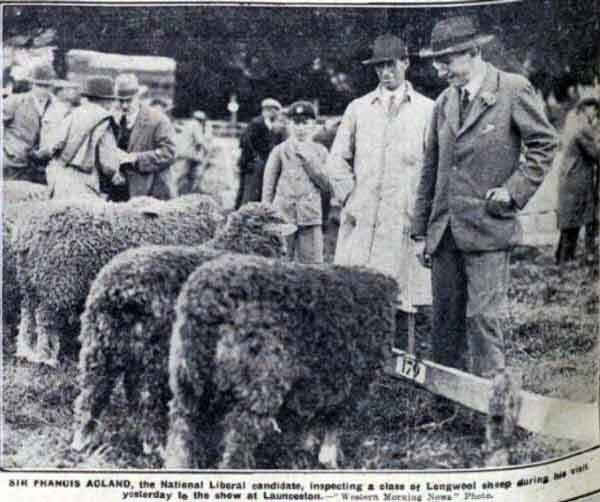 1932 Launceston Horse Show with Sir Francis Acland. Mr. E .G. 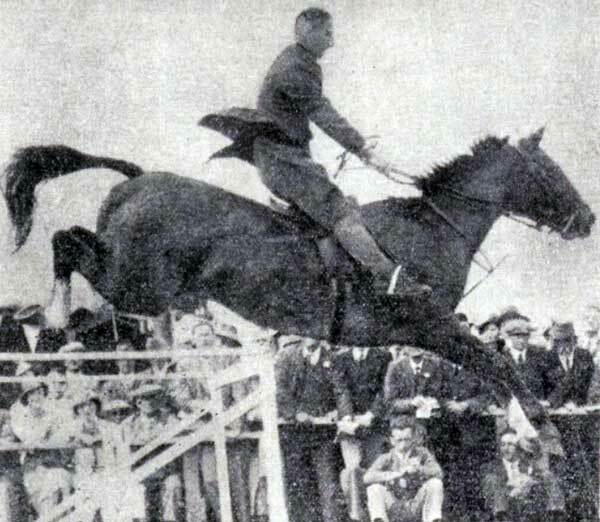 Dorse of Taunton on Silver Linnett at the 1935 Launceston Horse Show. 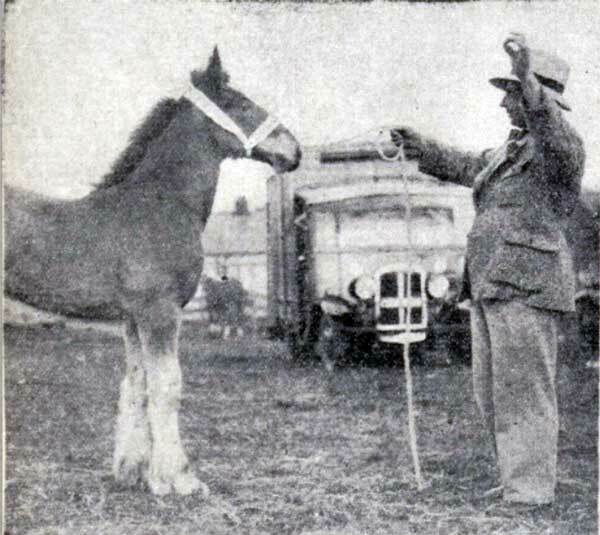 Mr. T. P. May with his prizewinning two month old shire foal Jubilee at the 1935 Launceston Horse Show. 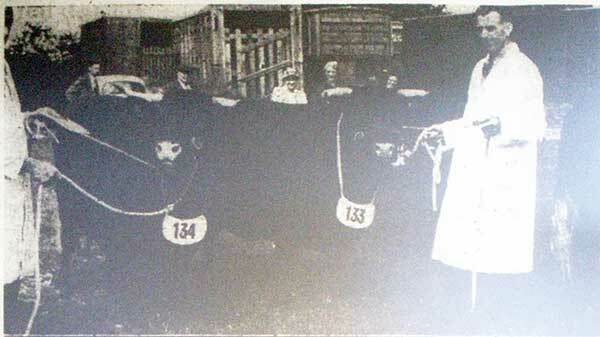 The cattle ring at the 1954 Launceston Horse Show. 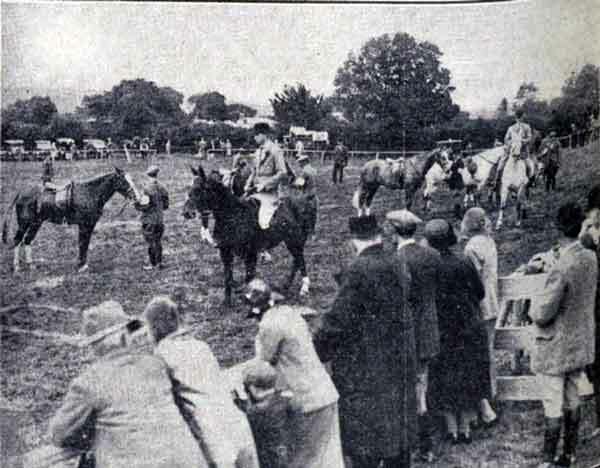 1932 Launceston Horse Show with the spectators watching the judging of the hunters and hacks. 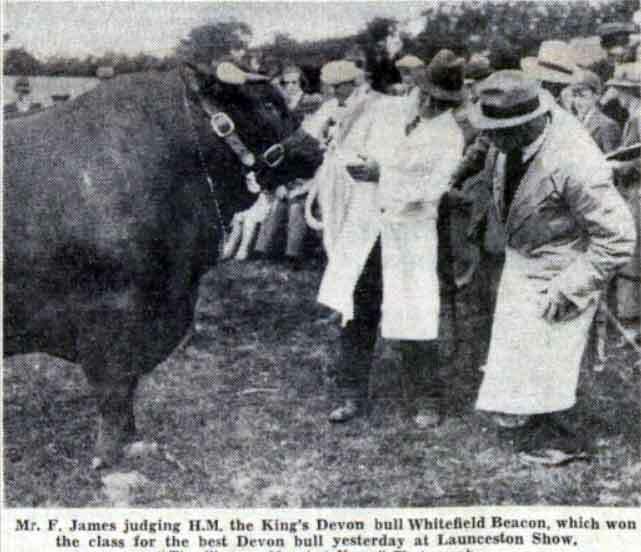 Bull judging at the 1938 Launceston Horse Show. 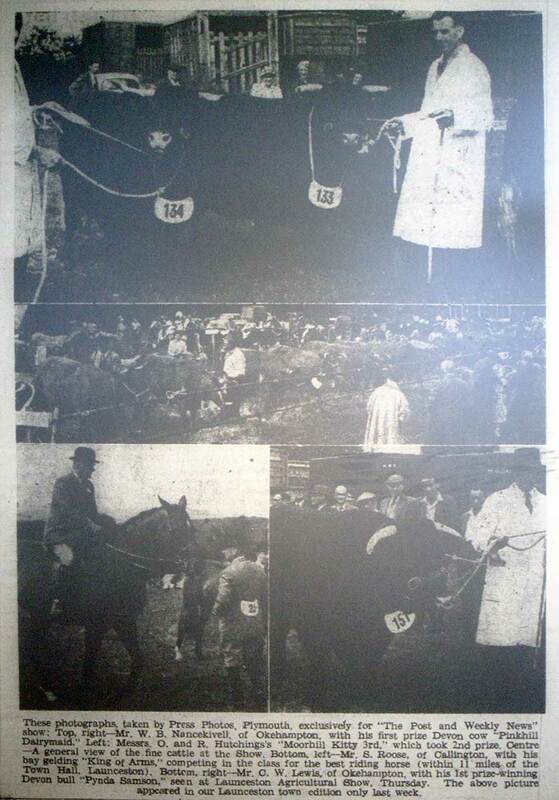 Horse shoeing contest at the Launceston Horse Show held on June 15th 1950. 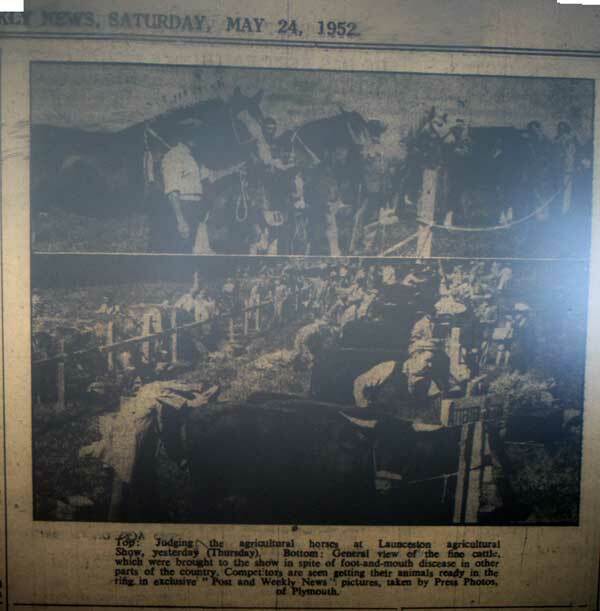 Horse and Foals judging at the 1954 Launceston Horse Show. 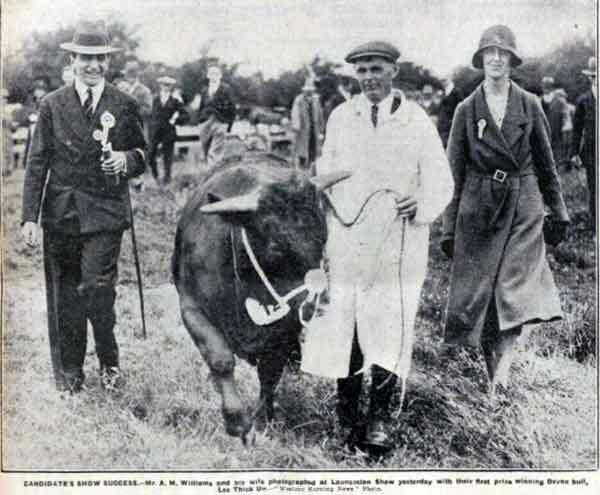 Mr. Nancekivell of Okehampton with his prizewinning dairy cow at the 1958 Launceston Horse Show. Stenlakes stand at the Launceston Show.